Cut tortillas in half, and then cut the halves into 1/4­ inch wide strips. Put 1 inch oil into a frying pan. Heat oil over medium­ high heat until a small piece of tortilla begins bubble. Working in three batches, fry the tortilla strips in the oil, until lightly browned and crisp. Remove the tortilla strips from the pan and let drain on a paper­ towel­ lined plate (You can salt at this point if you want, but not necessary, but makes them yummy). Spoon a few tablespoons of the frying oil into a dutch oven or a 3 quart pot, add the onions and chicken (I like to salt & pepper the chicken at this point). Cook until chicken begins to get nicely browned. Add chopped pepper and cook for 2-3 minutes, stirring often. Then add the chopped garlic, cook for another minute. Add the broth, tomatoes, and salt. Increase the heat to high, heat until the soup begins to boil, then reduce the heat to a low simmer, cover and simmer for 15 minutes. Pit, peel, and cut the avocado into 1­ inch pieces. 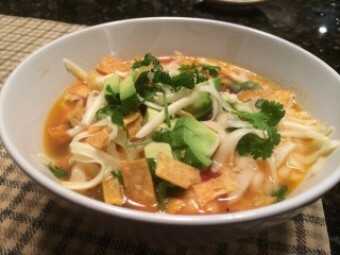 Divide half of tortilla strips among 4 individual serving bowls; ladle in soup. Top with avocado and cheese; garnish with remaining tortilla strips and cilantro. Serve with lime wedges.